Ever since I discovered the program “Fixer Upper” and Joanna Gaines’ style, I’ve fell in love with the modern farmhouse décor. The simplicity and clean look of this kind of decoration and recycled/reused approach of this style is something I can relate to. 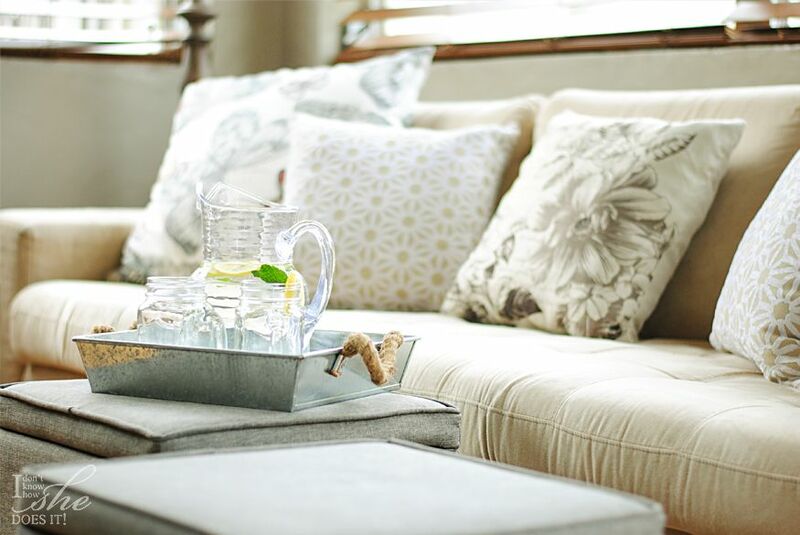 Although I live in a 1938 house with a Mediterranean Revival style, which has somewhat evolved through the years; I wouldn’t mind adding some touches inspired in this new trend of modern farmhouse in the hopes of adding personality to any space. Since I’m new to this style, I’ll start with a small area in our home; the tv room. This space is where we spend most of our time and where the girls like to express their creativity when it comes to scattering their toys around. So trying to keep everything organized and tidy will be one big challenge. In the past I used a small console that my father helped me build, to conceal all the kids mess; but with all the puzzles and school stuff somehow it suddenly became too small. I found a wider more spacious version called “Oxford Square TV Stand and Console” from BHG products at Walmart and to my surprise, it fits amazingly in this room. 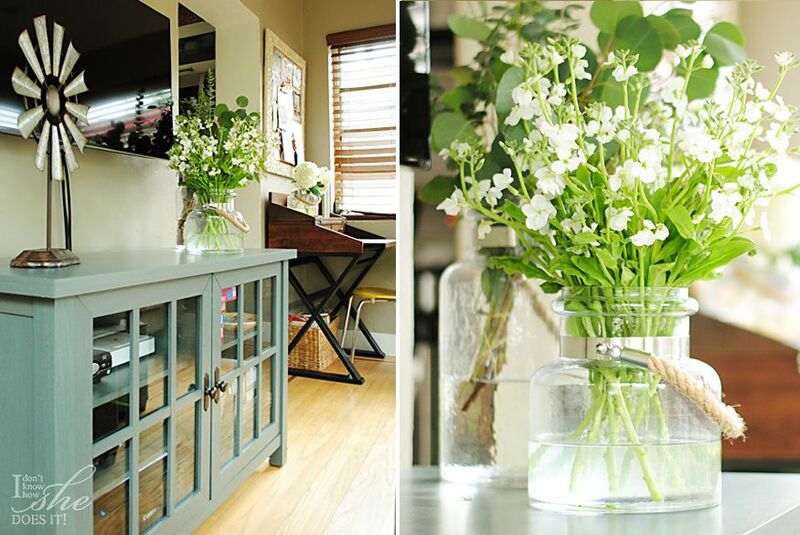 Its grayish blue color and tempered glass doors gives it a subtle vintage look. 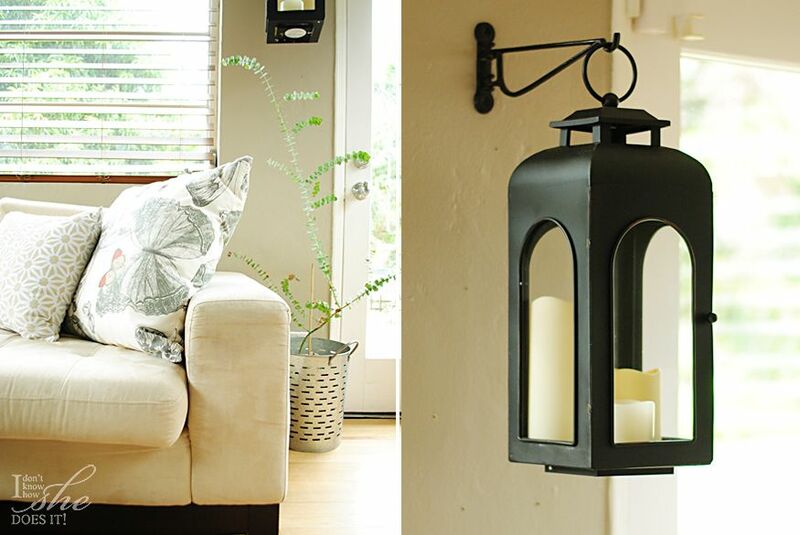 Other items I found that added that farmhouse look to our TV room were a couple of “glass lanterns with the hemp rope handle“. These pieces are a versatile accent since they will display many things from candles to flowers or even a cute terrarium. I’ve used these many, many times and in different parts of our home and each time I fall even more in love with these lanterns. Talking about lanterns, my new acquisition is the “Domed Metal Outdoor Lantern” from BHG at Walmart. I know these are made to stand inclement weather, but I couldn’t resist hanging one in our TV room. My initial thought was to use it as a plant holder, but since I couldn’t find the right hanging plant, I ended up placing 3 battery operated candles. Sometimes thinking out of the box can bring interesting results! Rustic wood is also used when decorating with this style in mind and the “Distressed Wood Finish Turned Floor Lamp” from BHG at Walmart added the perfect dose of farmhouse to this area. Galvanized metal is another strong element I’ve seeing repeatedly in many interiors. Accessories made in this material don’t have to be big to make their presence count. To display the beauty of my new eucalyptus plant, I used a BHG Galvanized Round Bin found at Walmart a couple of months ago. I think these two make a perfect pair! I couldn’t finished this area without adding a couple of more traditional decorative pillows but with that farmhouse vibe. 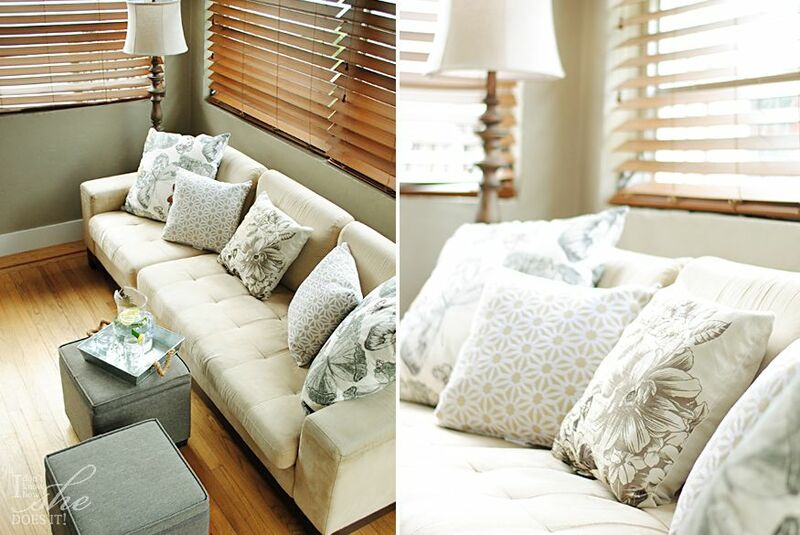 These neutral colored pillows add texture to our sofa without overcrowding the setting. Both the “FloralStamp Pillow” and the “Pinwheel Decorative Pillow” are also from BHG at Walmart. Shiplap aside, a modern farmhouse look can be achieved with some key accessories. Have you tried this style in your own home? 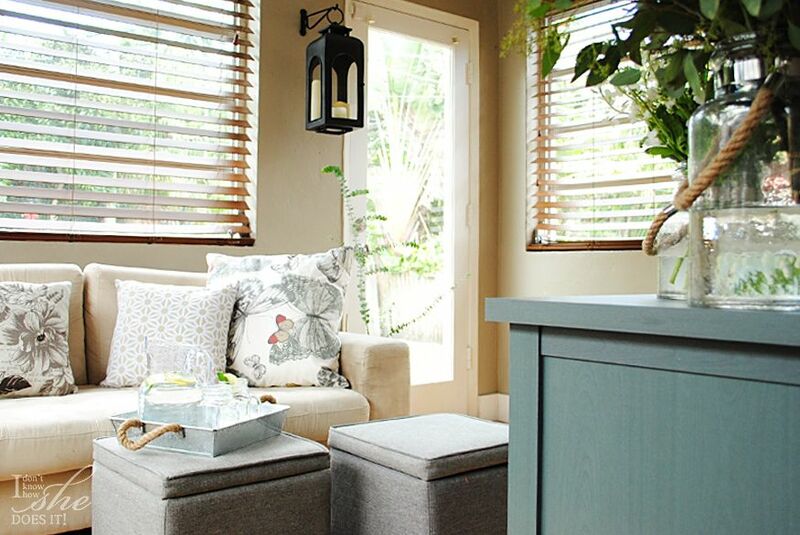 Which are your favorite accents when recreating this Joann Gaines inspired trend? Love the idea of the lantern indoors! Looks awesome! Thanks Oscar! I'm still looking for a plant that I can put inside this lantern. Any ideas? Thanks friend! The room looks awesome and I am a huge fan of Jo Jo 😉 That console piece is beautiful. Love the color!! So pretty! The lantern is darling! Thanks! It is my favorite accessory here! Thanks Shannon! This style feels so relaxed and welcoming; I love that sensation! Love how you styled everything! So beautiful!